Every industry comes with a huge set of associated risks, with Oil and Gas/ Petrochemicals/ Refineries and major chemical industries are vulnerable. Risk factors are high particularly for the larger size companies involved in more Unit operations. Risks are mainly to Personnel , environment, Assets and reputation. Bigger the size of operations, more the number of variables and third party elements exponentially increasing the risk factors. The risks are spread across economy, personnel, environment, equipment, production and efficiency. Most of the chemical industrial accidents are due to the failure of control and Safety system. Failure of the Safety system is caused by poor specification/ design/ installation/ Operation and maintenance and changes during operation. Why do organisation prefer to do SIL studies? Process Safety Management(PSM) section of the OSHA standard OSHA 29 CFR Part1910.119 requires organizations to provide assurance of the mechanical integrity of all their emergency shutdown systems and safety critical controls. Safety Life cycle concept is the fundamental tool of managing the application of Safety instrumented systems as by the international standards IEC 61508 which is an umbrella for all sectors and IEC61511 which is process Sector specific. The purpose of a safety instrumented system (SIS) is to reduce the risk that a process may become hazardous to a tolerable level. This is done by reducing the likelihood of the risk. What is SIL (Safety integrity limit)? SIL is a discrete level (one out of a possible four) for specifying the probability of a safety instrumented system. For Process Sector it is SIL 1 to SIL 3. The amount of risk reduction that an SIS can provide is represented by its safety integrity level (SIL), which is defined as a range of probability of failure on demand. What are the benefits of implementing Safety Life cycle as part of PSM implementation? Identify the hazards at the concept stage and evaluate the consequence there by Helps the organisation to take decisions at the design stage achieves loss prevention and reduction in cost. Significant cost saving in potential financial loss due to Asset damage and business interruption. 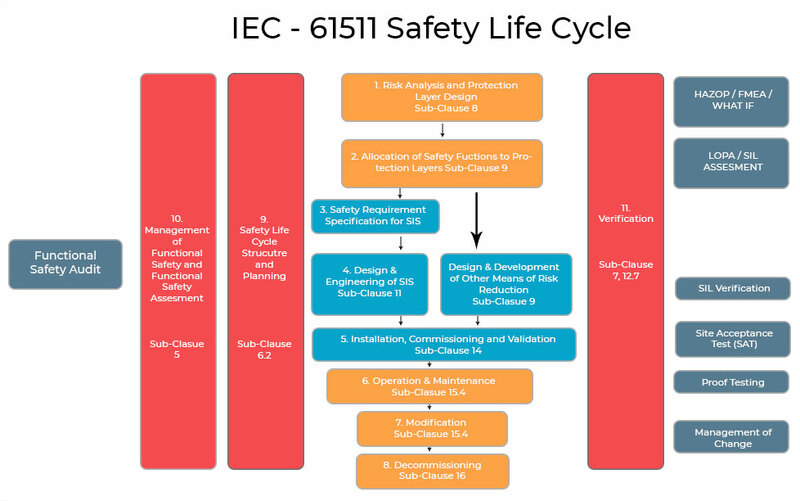 By adapting to IEC 61511 , uniform global design criteria is met.